Waste: a problem or a resource? Waste is not only an environmental problem, but also an economic loss. On average Europeans produce 481 kilogrammes of municipal waste per year. An increasing share of this is recycled or composted, and less is sent to landfill. How can we change the way we produce and consume so as to produce less and less waste, while using all waste as a resource? 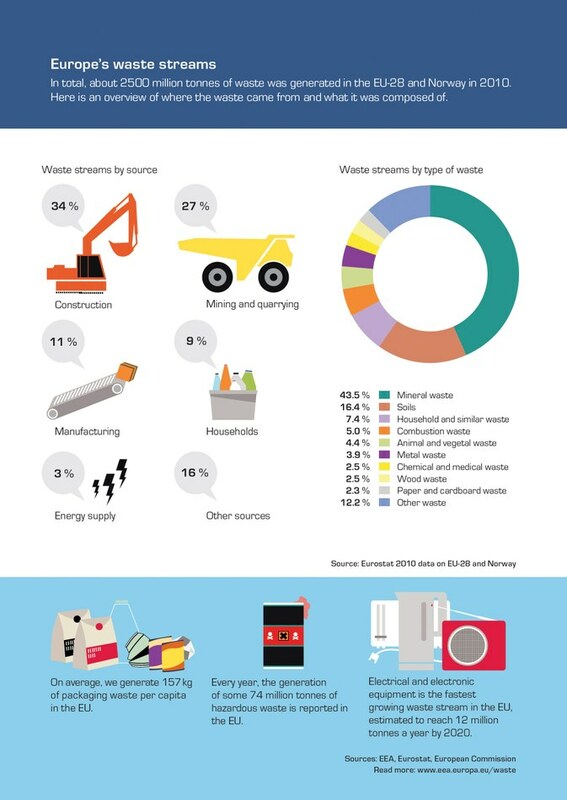 Europe generates large amounts of waste: food and garden waste, construction and demolition waste, mining waste, industrial waste, sludge, old televisions, old cars, batteries, plastic bags, paper, sanitary waste, old clothes and old furniture… the list goes on. The amount of waste we generate is closely linked to our consumption and production patterns. The sheer number of products entering the market poses yet another challenge. Demographic changes, like an increase in the number of one-person households, also affect the amount of waste we generate (e.g. packaging goods in smaller units). The large spectrum of waste types and complex waste-treatment paths (including illegal ones) makes it difficult to get a complete overview of the waste generated and its whereabouts. There are data, albeit of varying quality, for all types of waste. The EU Data Centre on Waste compiles waste data at European level. According to data for 2010 for 29 European countries (i.e. EU‑28 and Norway), around 60 % of the waste generated consisted of mineral waste and soil, largely from construction and demolition activities and mining. For metal, paper and cardboard, wood, chemical and medical waste and animal and vegetal wastes, each waste type ranged from 2 % to 4 % of the total. Around 10 % of the total waste generated in Europe consists of what is known as ‘municipal waste’ — waste generated mainly by households, and to a lesser extent by small businesses, and by public buildings such as schools and hospitals. In 2012, 481 kg of municipal solid waste was generated per person in the 33 member countries of the European Environment Agency (EEA). There is a slight downward trend from 2007 onwards, which can be explained partly by the economic crisis affecting Europe since 2008. The slight dip observed in municipal waste generated in the EU might have helped reduce the environmental impacts of waste, to some extent. However, while waste quantities are important, waste management also plays a key role. Overall in the EU, an increasing amount of waste is recycled and a decreasing amount is sent to landfills. 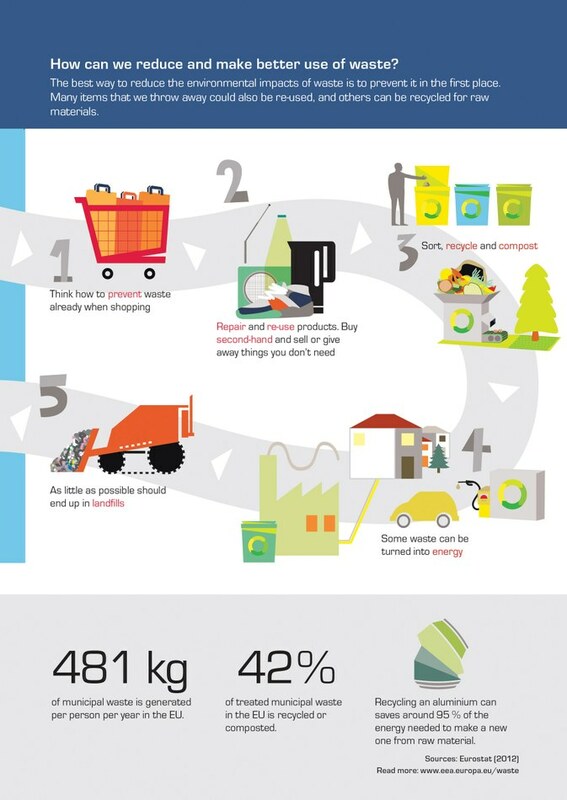 For municipal waste, the share of recycled or composted waste in the EU-27 increased from 31 % in 2004 to 41 % in 2012. Despite these achievements, large discrepancies still exist between countries. For example, Germany, Sweden and Switzerland each send less than 2 % of their municipal waste to landfills, while Croatia, Latvia and Malta each landfill more than 90 %. Most of the countries with low landfilling rates have high recycling and incineration rates, both above 30 % of their total municipal waste. 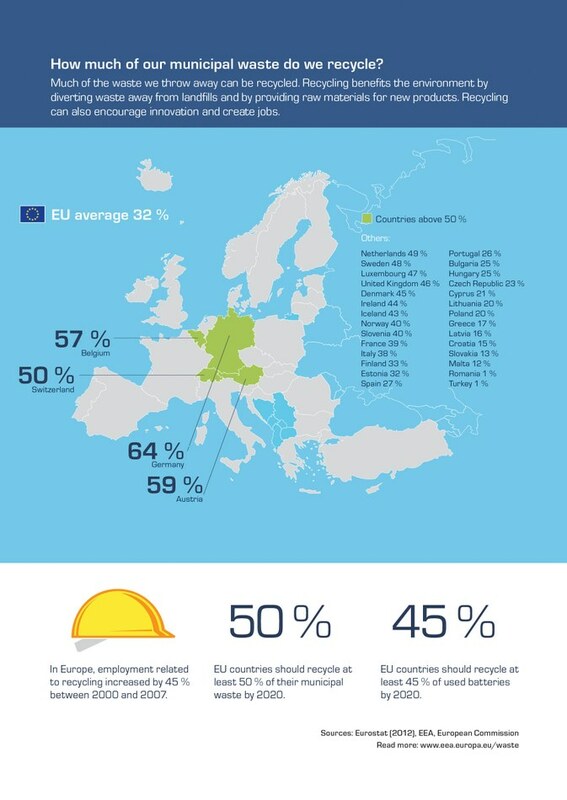 The shift in waste management is closely linked to EU waste legislation. The key piece of legislation in this area is the Waste Framework Directive (WFD). It outlines a waste management hierarchy: starting with prevention, followed by preparing for re-use, recycling, recovery and ending with disposal. It aims to prevent waste generation as much as possible, to use waste that is generated as a resource and to minimise the amount of waste sent to landfill. The WFD along with other EU waste directives (on landfilling, end-of-life vehicles, e-waste, batteries, packaging waste, etc.) includes specific targets. For instance, by 2020, each EU country has to recycle half of its municipal waste; by 2016, 45 % of batteries need to be collected; by 2020, 70 % of non-hazardous construction and demolition waste (by weight) has to be recycled or recovered. EU countries can adopt different approaches in order to reach their waste targets. Some approaches seem to work better than others. For example, if designed well, landfill taxes appear to be an effective way of reducing landfilled waste. Extended producer responsibility, where the producer has to take back the product at the end of its life, also seems effective. Poor waste management contributes to climate change and air pollution, and directly affects many ecosystems and species. Landfills, considered the last resort in the waste hierarchy, release methane, a very powerful greenhouse gas linked to climate change. Methane is formed by microorganisms present in landfills from biodegradable waste, such as food, paper and garden waste. Depending on the way they are built, landfills might also contaminate soil and water. After waste is collected, it is transported and treated. The transport process releases carbon dioxide — the most prevalent greenhouse gas — and air pollutants, including particulate matter, into the atmosphere. Part of the waste might be incinerated or recycled. Energy from waste can be used to produce heat or electricity, which might then replace the energy produced using coal or other fuels. Energy recovery of waste can thus help reduce greenhouse gas emissions. Recycling can help even more to lower greenhouse gas emissions and other emissions. When recycled materials replace new materials, fewer new materials need to be extracted or produced in the first place. Some ecosystems, like the marine and coastal ones, can be severely affected by poor management of waste, or by littering. Marine litter is a growing concern, and not only for aesthetic reasons: entanglement and ingestion constitute severe threats to many marine species. Waste impacts the environment indirectly as well. Whatever is not recycled or recovered from waste represents a loss of raw material and other inputs used in the chain, i.e. in the production, transport and consumption phases of the product. Environmental impacts in the life-cycle chain are significantly larger than those in the waste management phases alone. Illegal activities such as illegal dumping, burning or exports also play a part, but it is difficult to estimate the full extent of such activities, or of their impacts. Waste also represents an economic loss and burden to our society. Labour and the other inputs (land, energy, etc.) used in its extraction, production, dissemination and consumption phases are also lost when the ‘leftovers’ are discarded. Moreover, waste management costs money. Creating an infrastructure for collecting, sorting and recycling is costly, but once in place, recycling can generate revenues and create jobs. There is also a global dimension to waste, linked to our exports and imports. What we consume and produce in Europe could generate waste elsewhere. And in some instances, it actually becomes a good traded across borders, both legally and illegally. What if we could use waste as a resource and thereby scale down the demand for extraction of new resources? Extracting fewer materials and using existing resources would help avert some of the impacts created along the chain. In this context, unused waste also represents a potential loss. Turning waste into a resource by 2020 is one of the key objectives of the EU’s Roadmap to a Resource Efficient Europe. The roadmap also highlights the need to ensure high-quality recycling, eliminate landfilling, limit energy recovery to non-recyclable materials, and stop illegal shipments of waste. And it is possible to achieve these things. In many countries, kitchen and gardening waste constitutes the biggest fraction of municipal solid waste. This type of waste, when collected separately, can be turned into an energy source or fertiliser. Anaerobic digestion is a waste treatment method that involves submitting bio-waste to a biological decomposition process similar to the one in landfills, but under controlled conditions. Anaerobic digestion produces biogas and residual material, which in turn can be used as fertiliser, like compost. An EEA study from 2011 looked at the potential gains from better management of municipal waste. Its findings are striking. Improved management of municipal waste between 1995 and 2008 resulted in significantly lower greenhouse gas emissions, mainly attributable to lower methane emissions from landfill and emissions avoided through recycling. If, by 2020, all countries fully meet the Landfill Directive’s landfill diversion targets, they could cut an additional 62 million tonnes of CO2 equivalent of greenhouse gas emissions from the life cycle — which would be a significant contribution to the EU’s climate change mitigation efforts. The potential gains are immense, and they can facilitate the EU’s move towards a circular economy, where nothing is wasted. Moving up the waste hierarchy offers environmental gains, even for countries with high recycling and recovery rates. Unfortunately, our current production and consumption systems do not offer many incentives for preventing and reducing waste. From product design and packaging to choice of materials, the entire value chain needs to be redesigned first with waste prevention in mind, and then the ‘leftovers’ of one process can be made into an input for another. Moving up the waste hierarchy requires a joint effort by all the parties concerned: consumers, producers, policymakers, local authorities, waste treatment facilities, etc. Consumers willing to sort their household waste can only recycle if the infrastructure for collecting their sorted waste is in place. The opposite also holds true; municipalities can recycle an increasing share only if households sort their waste. Ultimately, whether waste will constitute a problem or a resource all depends on how we manage it. How can we reduce and make better use of waste? The best way to reduce the environmental impacts of waste is to prevent it in the first place. Many items that we throw away could also be re-used, and others can be recycled for raw materials. For references, please go to https://www.eea.europa.eu/signals/signals-2014/articles/waste-a-problem-or-a-resource or scan the QR code.